When I was given a list of objects to draw to illustrate the Story Trail for the Keighley’s War exhibition at Cliffe Castle, some things seemed pretty straightforward, and others – well, not. One of them was a small sepia photograph of workers in the National Shell Factory in Keighley. Indistinct, detailed, crowded, complex, and behind glass – I was at a loss as to quite how I was going to approach it. But as it turned out, it was perhaps the most fascinating and enjoyable subject of all the curious objects I drew, and a lot of this was due to the way I set about doing it. My usual sketching method relies a lot on line, and a pen is what I generally start with. But here I could see that was simply not going to work – the photograph was simply a mass of complicated tonal values. So I decided to jump straight in with watercolour with almost no drawing, even in pencil, and build it in stages as a painting. (Click on any of these images to see them larger). Once I’d got to the halfway point I realised it would be interesting to record it stage by stage, so I’ve had to simulate stage one by editing the second stage photo with a bit of bleaching and blurring, but basically the first thing I did was to put down large washes of pale colour and tone with no detail at all, reserving just a few small white unpainted areas. Then in the next stage I started to construct by blocking in more tone and colour, leaving pale spots for faces and highlights….. Stage three, below, doesn’t look a whole lot different but by this time I’ve started to deepen and darken certain areas and define some parts more clearly. 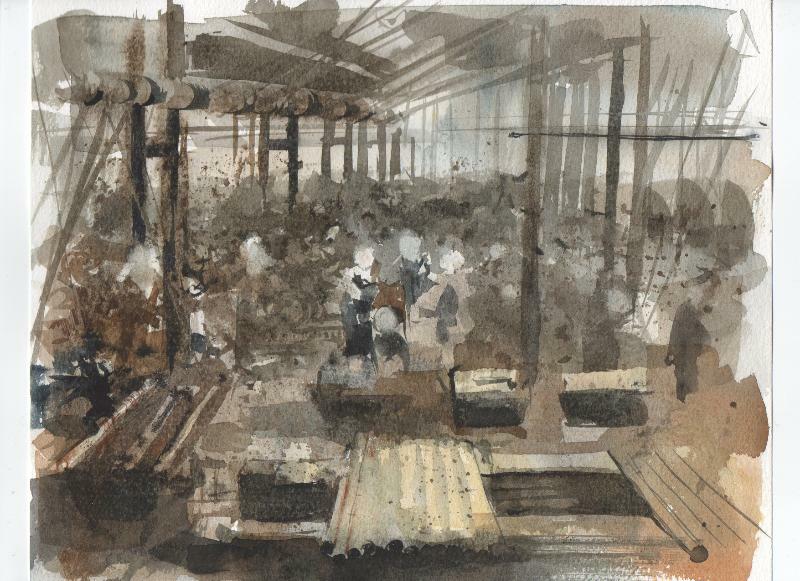 And finally I worked in just enough detail to focus on some of the principal faces and some bits of machinery. (Here I did use a very small amount of line with a pen – and here and there a touch of watercolour pencil, plus tiny bits of white gouache for highlights).  I wanted to keep a feeling of the complexity of the scene which is extremely crowded and busy without getting carried away with the detail – so that the principal characters stand out as the focus of the story, along with the machinery they’re using and the work that they’re doing. 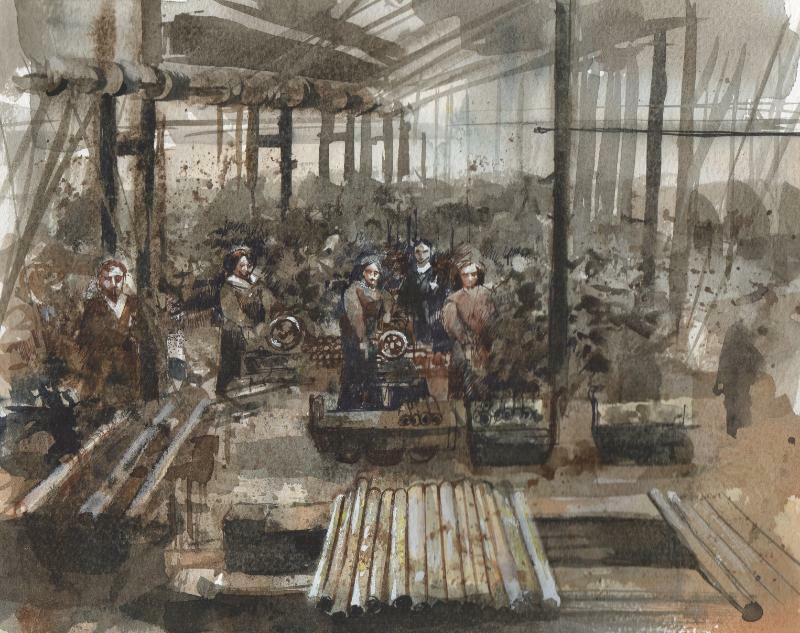 It would be wonderful to know who these people were, their names, their stories – what exactly was happening there in the factory on this day, November 13th 1915. 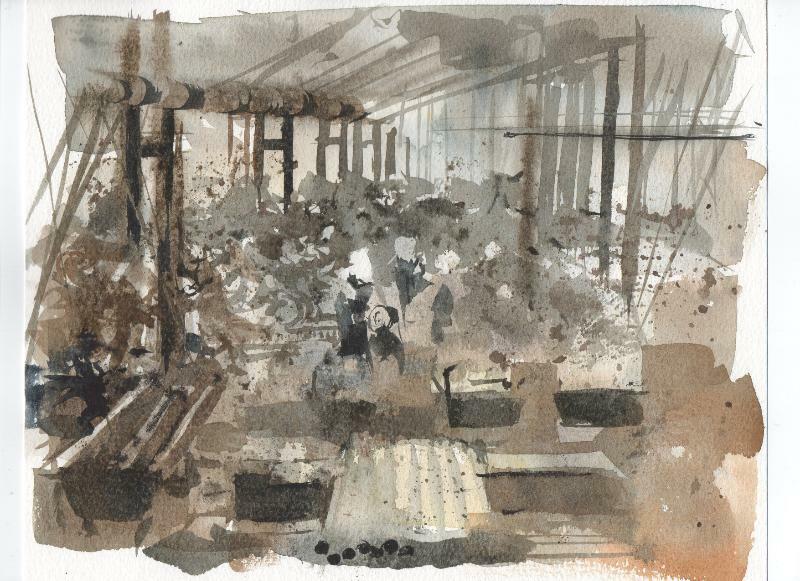 All I know about them as individuals is what I learned from studying the photograph, but drawing it let me sink into its depths, absorbing how it must have felt to work in this wartime munitions factory. Just look – here’s the photograph. A new exhibition opens this week at Cliffe Castle Museum. Keighley’s War commemorates the end of the First World War, exploring some of the ways the lives of the people living in this part of West Yorkshire were affected by the fighting, the trauma and suffering, and the seismic social changes which were a part of the period. It goes without saying that the First World War is not an easy subject to reflect on. History is full of dark times as well as moments that are easier to look back on – and this period in particular is full of things that are frankly terrible, a huge challenge to present it as the subject of an exhibition. But spending some time learning about the lives of our not-very-distant ancestors, the conditions in which they lived, the challenges they faced and the social changes that affected them is deeply worthwhile, and a compelling journey of discovery. To offer this journey the museum has produced a clever, concertina-fold illustrated Trail that unfurls and becomes a guide-book to help visitors search out and find objects in the collections. Each one of these objects has a story to tell about the First World War – and I was asked to draw them to illustrate the guide. Unsurprisingly, working on the drawings was an absorbing, challenging, and often disturbing experience. Getting to know something intimately by drawing it means that you literally get drawn in – and all these objects had a powerful effect on me. So I thought it would be interesting to share a bit about what this felt like and what I discovered – the story of the drawings, one at a time. Here are two; others I’ll write about in future posts. I had no idea what this was when I first saw it. 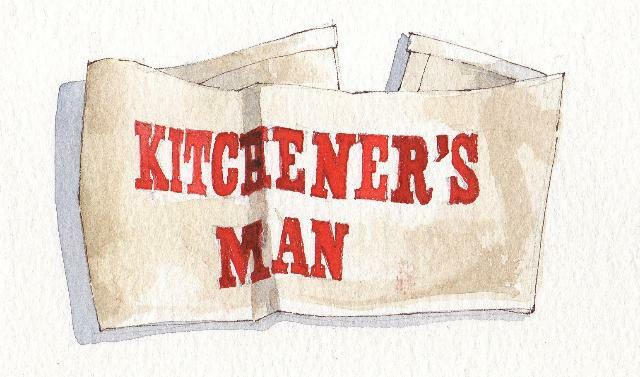 A piece of stitched calico printed with the words ‘Kitchener’s Man’. I knew the famous recruiting poster of Lord Kitchener with his finger pointing directly out, with the words ‘Your Country Needs You!’ but I didn’t know that those early volunteers were called ‘Kitchener’s Men’, and because at first there weren’t uniforms to issue to these civilian soldiers they were given cotton armbands like this one to wear. The men who joined up from a local district were often formed into single units which turned out to be an appalling decision. In their book ‘Kitchener’s Mob‘ Peter Doyle and Chris Foster describe how the idea of recruiting men into local “Pals” regiments – essentially all coming from the same community – was a tragic mistake when later these close-knit communities were devastated by the loss of their young men – fathers and sons, brothers and cousins. The cover photo of the book shows recruits at Grassington Station proudly wearing their armbands – the Upper Wharfedale chaps leaving their home village on September 21, 1914, on their way to boost the troops of the regular army which had embarked for France on August 4. Massively outnumbered but with their murderous rapid rifle fire, they were attempting to hold off the hordes of German soldiers sweeping across Flanders and northern France. This is not an especially rare artifact. 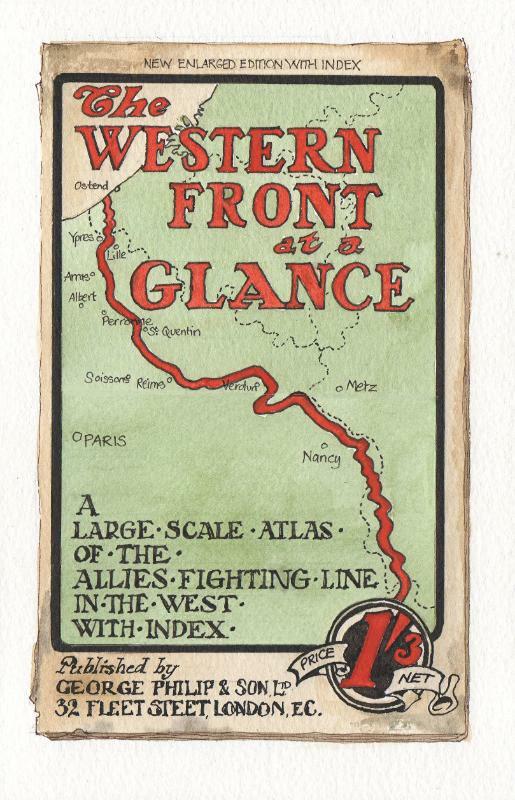 You can still buy copies of this booklet on Ebay and elsewhere (different editions were published as the war progressed, at different prices) but what I was so struck by was the condition of this copy. It’s worn and dog-eared, well thumbed at the corners and cracked at the spine. Whoever owned this book must have pored over it daily, studied the route and the progress of – who? A husband? Brother? Son? The drawing took a long time to do and I had the opportunity to immerse myself completely in the graphic style of the period – the colours, the fonts, the layout. And I kept thinking what a strange mixture of ideas it represents – on the one hand a kind of cheerful, eager, educational guide to troop movements and military events (it reminded me a bit of the I-Spy books we used to use as children) and on the other – a terrible reminder of what was happening day by day to the soldier in your family, so far from home. As a counterpoint – and a different view of the events of 1914 – 18, the opening of the exhibition Keighley’s War coincides with International Conscientious Objector’s Day on the 15th May, a day marked this year by the Peace Museum in Bradford by a lecture called ‘Oh What a Lovely War-Resistance; music in opposition to war, 1914 – 18’. It’s easy to find recollections of heroism in acts of war; what’s not so easy is to remember the particular kind of courage it took – and takes – to refuse to fight and oppose military action. The Peace Museum is a unique celebration of the peace movement and its history, exploring the often untold stories of peacemakers and social reform.